What is the difference between project management practices in Canada and in other countries? How can you become a professional engineer in BC and what are the ways to get Canadian experience? These were just some of the questions that participants in IEC-BC’s “Connections Event for Engineers” were eager to find the answers to. Organized in partnership with the City of Vancouver and the Vancouver Immigration Partnership (VIP), the event brought together 30 internationally trained engineers who are new to Canada, employers from the City of Vancouver, Urban Systems, and Stantec, and representatives of the Applied Science Technologists and Technicians (ASTTBC) and Engineers and Geoscientists of BC (EGBC). Participating employers also spoke about the value immigrants bring to their organizations. “They are some of our best staff,” said Cheryl Nelms, Deputy General Manager, Engineering Services, at the City of Vancouver. The small-group event format allowed for in-depth conversations with local employers and association representatives. Immigrant engineers had a chance to meet their peers, broaden their networks and learn about the different skillsets needed for different engineering roles in BC. Participating employers offered insights into how their engineering departments work and what transferable competencies and skills they are looking for in new hires. Participants noted that tips on how to develop resumes and make them “stand out” or approach an informational interview were some of the key event learnings. They also had an opportunity to find out about the impacts of IEC-BC’s MentorConnect Program and learn about the resources offered through the Skilled Immigrant Info Centre at the Vancouver Public Library. “Building local networks and understanding the local job market are key to finding a job here,” said Nadia Carvalho, VIP coordinator. She noted that hosting events that allow for direct connections and networking between skilled immigrants and local professionals are one of the priority actions for her organization. 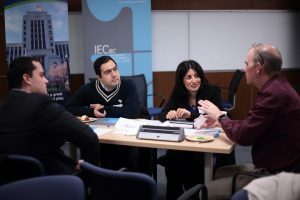 This was the fourth Connections Networking event for skilled immigrants in different industries co-hosted by IEC-BC with partner organizations.